We all occasionally fantasize about our dream home, but few of us ever manage to make it a reality. And how does the architect himself live? In this case, the private home of architect Hans van Heeswijk led to a spacious and light-filled house full of special details. The client and architect Van Heeswijk was encouraged not to settle for off-the-peg solutions. Instead, he seized the opportunity to work to a higher level of ambition in terms of how to use energy, how to maximize the potential of technology, how to respond to the context, and how to stretch the limits of what is possible. The result is a real machine for living in. While the front of this waterside house, on the recently developed island of IJburg near Amsterdam, is clad in perforated aluminium panels, the rear is entirely glazed, so that residents can watch the sun set. Some of these panels are positioned behind windows and can be opened automatically to allow light to enter. The waterfront façade, by contrast, is completely open and orientated to the view. On the second floor, part of the volume is omitted to create space for a screened roof terrace. Typical of Van Heeswijk’s designs is the application of ‘timeless’ materials such as glass, steel, concrete and wood. The sensory experience is largely determined by the transparency achieved and a flowing spaciousness that extends from high to low and from big to small. Located in the centre of the plan is a core (the ‘magic box’) that rises the full threestorey height of the building and is wrapped in wenge timber for acoustic reasons. The core contains storage closets, a toilet on every floor, cables and a dumbwaiter. Openings in the floor slabs create double height spaces in the large groundfloor dining area, a first-floor living area and second-floor master bedroom. Views become increasingly panoramic towards the top of the house. Balustrades made of glass ensure unobstructed views from the balconies. The house is designed to accommodate the family’s way of living. When changing clothes in the bathroom, they throw the laundry into a tube that carries it down two floors to the washing machine. Once washed and ironed, the clothes are carried back upwards on a small lift. All of this underlines the effective and efficient design of the house. Van Heeswijk took the opportunity to design almost everything specially for his home. From furniture, shelves, bathroom furniture, benches, cabinets, fireplace, long dining tables, a kitchen island with built-in dessert trolley to the door handles. The door and window fittings are now in the collection of Post & Eger, series ‘Wave’. 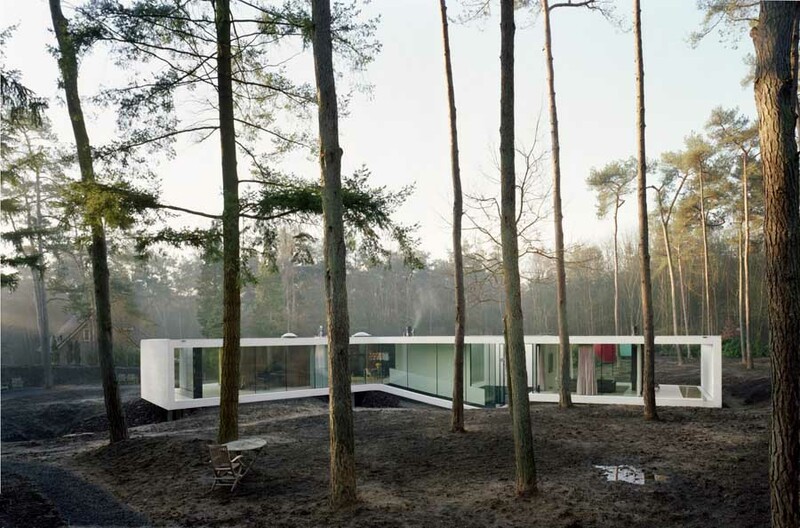 The house has been nominated for the Amsterdam Architecture Prize 2012. The winner will be announced by the end of April 2012.